It's great. About Uighur refugees after the collapse of their steppe state, and how they tried to negotiate with China: can we come in? We've helped you in the past. As the author makes you aware, we have most of this history from Chinese sources, and the Uighurs haven't left their side of the story. Most of the Uighurs who fled to China after the destruction of their steppe empire met with grief and annihilation. Were we able to hear the story from their perspective, our understanding of these events would undoubtedly be clearer and richer. Even so, Drompp sincerely tries to correct the imbalance. We have these events in rare detail, on a level of individuals, and where else can we glimpse Uighur historical actors as individuals? It adds greatly to history on them. 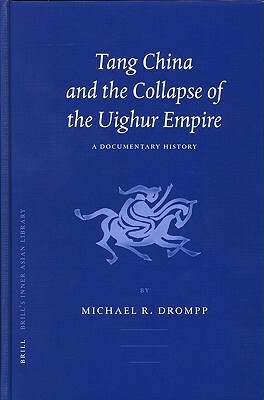 Another source is Mackerras The Uighur Empire According To The T'ang Dynastic Histories: A Study In Sino Uighur Relations, 744 840, but that is translation of the official histories, while this book, for the first time, translates a trove of documents other than official history. A hundred pages is given to these translations: discussions of the crisis, diplomatic letters, missives between officials. He looks at the differences between public and private documents: what's admitted in-house, what glosses are used in public, changes of tone towards the Uighurs themselves as events develop. It's an absolute case study of the politics of a single incident. What happens to this group of refugees? I'm afraid most are massacred in the end -- those that haven't put on Chinese clothes and taken new names such as Li Loyal-Thoughts, Li Great-Obedience. ...in the collapse of an empire can be seen the gloomy failure of a mighty human endeavor. This failure is particularly poignant in that it often signals an end to political order and the unleashing of chaos -- a terrifying prospect for most human beings. The downfall of a massive structure is inherently magnetic. We cannot look away. Sign into Goodreads to see if any of your friends have read Tang China And The Collapse Of The Uighur Empire.